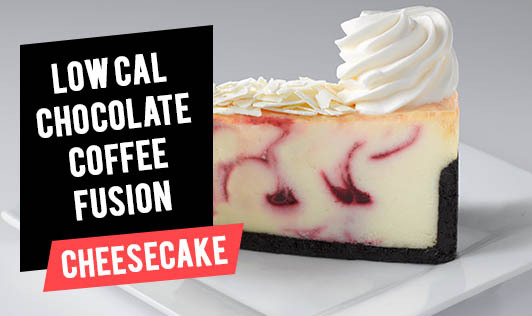 Chocolate and coffee are a match made in heaven. While cheesecake can be a bit fattening, you can use cocoa powder instead of fat-laden chocolate to make a low-calorie chocolate sauce and relish the yummy cake without worrying about gaining those extra kilos! For the cream cheese layer, blend the paneer, coffee, and sugar substitute in a mixer till it turns into a thick paste. Divide the mixture into 4 equal portions and set aside. For the biscuit layer, blend the biscuits with butter in a mixer, divide into 4 equal portions and keep aside. Make sure to blend lightly. For the chocolate sauce, mix the cocoa powder, butter, milk, and sugar in a nonstick pan and cook until the sugar melts. Add the corn flour paste and cook for 5 to 7 minutes while stirring continuously. Remove from the flame and keep it aside. Place a 2½" diameter ring mould on a flat plate. Put the biscuit mixture and press it down to make a ½" thick layer. Top it with a portion of cream cheese layer. Repeat similarly to make 3 more portions. Refrigerate the cake in a refrigerator for 4 to 5 hours. De-mould carefully and serve immediately with hot chocolate sauce.